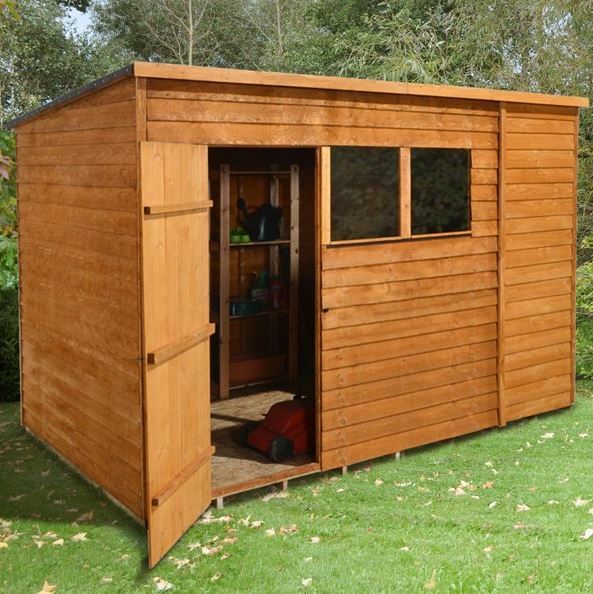 With a very classically British style, the Hartwood 10′ x 6′ FSC Overlap Pent Shed is offering you a nice amount of storage space that thanks to the interesting design can really take care of all of your storage needs. The reverse design of the shed will allow this to fit in very well along a back wall or some other out the way area of your garden and despite being 10 feet wide, that 6 foot of depth means that even gardens that are more on the compact size could possibly make use of this shed. The front of the shed has a very welcoming look to it with the high single door and the two windows that are allowing light to enter the shed, but not at the expense of privacy. The 8 mm thick overlap cladding and the frame behind it are joined together so securely that there is no nook or little cranny for rain to make its way into the shed. As well as making the shed watertight this also makes it very robust and long lasting. Solid sheet boarding is what will be under your feet and it is able to take the weight of any heavy items you have. 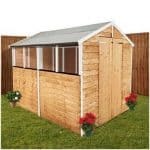 This really is a very well made shed and at just under, £400 they really have done a great job. 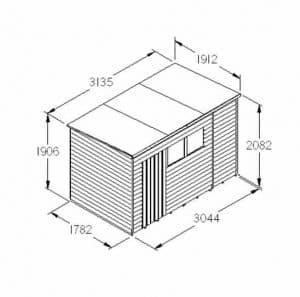 We really like what they have done with the Hartwood 10′ x 6′ FSC Overlap Pent Shed. 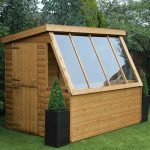 The reverse design makes this shed seem truly huge, but even though the width is a very impressive 10 feet 3 inches, the depth is 6 feet 4 inches so you will find that even though it is long, it is not going to stick out really far in your garden. These dimensions will allow you to store just a ton of items in here so that spare room that is just full of junk you are scared to throw out, now can be freed as you dump it all in here. 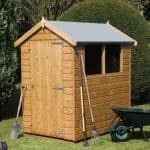 Tools, gardening equipment and even the kids bikes and outdoor toy will have a fantastic home with this shed. At its highest point the shed stands at 6 feet 10 inches high so you will have a generous amount of headroom when you are inside the shed. Using a pent roof on a shed of this size was a very interesting decision. First of all they have made it so that the roof slopes back and away from the door this was a very smart design choice and we applaud them for it. Sand felt is used to cover solid sheet boarding and to be honest while not the most exciting way to make a roof. It is very efficient, strong and is part of why, even though the shed is so large the price is so reasonable. We can assure you that you will have no worries about rain getting in through the roof. The overlap cladding is what gives the shed its classic good looks. It makes for one very interesting looking shed and as the cladding is 8 mm thick it is actually far more robust than the pictures suggest. If you have kids who like to kick a ball around the garden or just throw things in general, then this cladding is going to be able to take that kind of punishment. It is not just the fact that the cladding is well made and that the frame is 28 mm x 28 mm that makes this one very strong shed. It is the way they are connected together that really makes this one very solid shed. This kind of framing is something we have seen before and we are always impressed when we do. 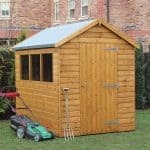 It is the perfect size to offer a set of bones for the shed, but it is not overly bulky and intrusive, eating into your storage space. The first thing that we noticed about the floor was the floor joists that are underneath it. These are spaced out well and they are also very thick and will stop the shed from sitting right on the ground. The actual floor is made with solid sheet boarding, the same kind of boarding that is used for the roof. Even your heavy items will be able to be stored in here and when you are walking around, you will be impressed with how strong the floor feels. Wood treatment will be required once you have installed the shed. Now we are not suggesting that once the last nail has been hammered in, you get the treatment out, but certainly within a week or two you will want to treat the shed. Once a year, wood treatment should be applied to the timber. You do this and you will never have any kind of problems with rot or decay. 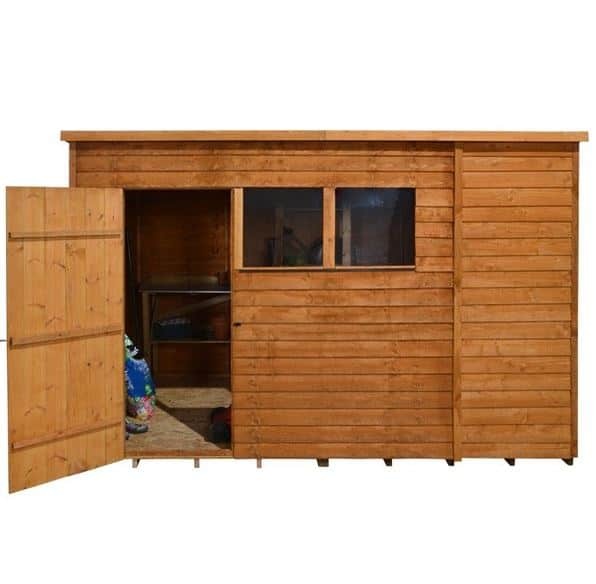 The Hartwood 10′ x 6′ FSC Overlap Pent Shed comes with a ten year guarantee. 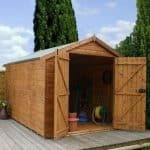 While this is a great guarantee, you are required to treat the shed and look after it properly in order for it to be valid. One very interesting thing about this shed is that there is only a single door on it. A shed of this size would normally have a double door, so seeing a single door is quite surprising. This door is of a decent size, but we must admit that a set of double doors right in the middle would have been just fantastic. The door is very well made in that they have used strong braces on the back and ensured it will not sag by using heavy duty hinges. Two windows are on the front of the shed and we know that for a shed of this size that may not seem like a good amount, but actually we feel that these two windows will allow in a decent amount of light. These are fixed windows so you cannot open them, but they are made from anti shatter styrene so again if you have kids the windows are able to take the abuse that kids may throw their way. We really like that they have included a hasp and staple, but we do feel that they could have included a padlock with this. While generally the shed is a secure structure if you are going to be putting expensive items inside here, you will want to make sure you have a padlock ready for once you have installed the shed. 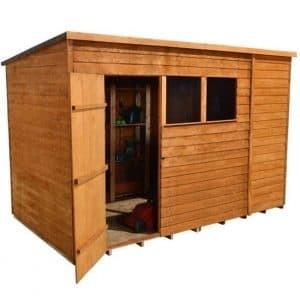 The two windows on the front of the shed allow in light, but as there is only two and they are not overly large, you will be able to hide away you more expensive and cool items from the neighbours and any potential thieves. While they are not actually offering any customisation options with this shed, you can have some fun and show off your creative side by giving the shed a coating of paint. If you want to kill two birds with one stone then you could even coat the shed with wood treatment that is coloured. We were not impressed that there was no included padlock with this shed, but you can add their Yale branded hasp and padlock set, which costs £19.99. While this is a high quality to lock the shed up, you could always just buy a cheap padlock and attach it to the already included hasp and staple. The other extra that they are offering you is their 10 x 6 plastic shed base that is priced at £165.99, and to be straight with you is not really something we would say is essential at all. This is a shed that is not just easy on the eyes. It is also very well made and we feel that it is as high quality as it possibly could be at the price they are asking for it. If you want a shed that is going to give you many, many years of use, then this is a shed that is going to do just that. These are some very strong materials that have been chosen because of their longevity so you are going to be able to store things in here for a long time. While the depth is not all that impressive, the 10 feet of width really is quite remarkable and will allow you to store a whole host of items in here. With this being just over 10 feet wide, you and the person helping you out are going to be at this for 6-8 hours. So be sure to have plenty of snacks and drinks on the go and also some good tunes can also help make this a far more pleasurable experience. 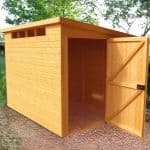 This is a shed that is very fairly priced and actually even with the low price they have still managed to make this be one very high quality shed. Final Thoughts: With a very old school kind of look, the Hartwood 10' x 6' FSC Overlap Pent Shed is something that made us smile the very first time we saw it. The impressive size of it is going to allow you to store plenty of tools, gardening equipment or even use it as just a place for general storage for items that you are sick of taking up space in the house. For those of you who want a shed that offers a very decent amount of storage space, but does not take up a huge amount of space then we feel that this is a shed that is going to offer you just that and also do it in a very unique and cool style as well.